This beautiful, immaculate and expanded popular Cedar model designer home is located in The Village of Gilchrist, convenient to Brownwood, Pinellas Plaza and Lake Sumter Landing. 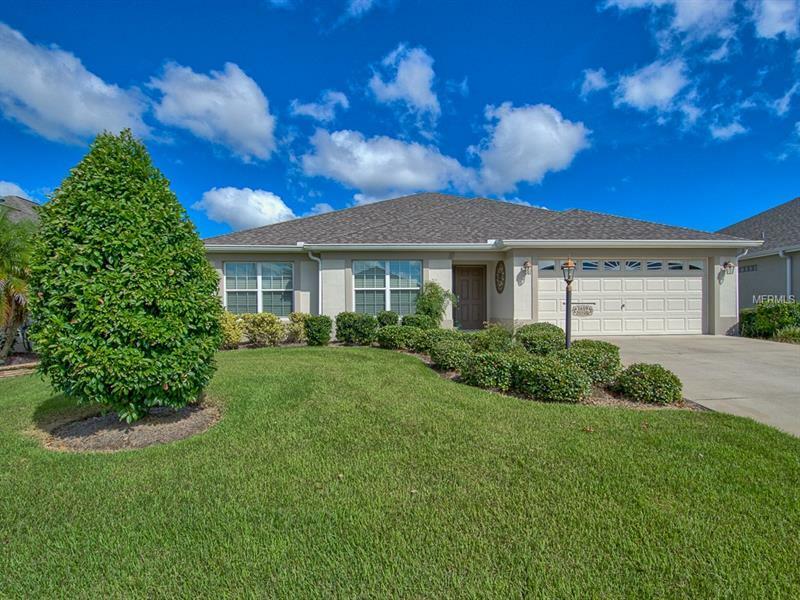 Lovely landscaping welcomes the visitor into an open and spacious living area with very attractive large neutral tile floors which are accompanied by soft neutral wall colors throughout the home. The tile floors extend throughout the entire living, dining, kitchen, inside laundry, bathrooms and lanai. The bedrooms are Friezze carpeted. The master bedroom features a tray ceiling and the bath includes a Roman shower and private commode room. The very popular open kitchen has all of the upgrades you would want - stainless steel appliances, beautiful honey maple cabinets, a large closet pantry with roll-out shelving, neutral Corian counters, a corner Lazy Susan and tiled back splash. The laundry room off of the kitchen has the same cabinetry plus a finished sink. And OH the lanai!! Measuring at 288 square feet the large lanai is under central heat and air with double pane insulated glass windows and solar shades. Because of this, the actual living are of the home is over 2100 square feet. Add a 9 x 15 patio to this for your grilling and outdoor living. PRIVACY? Got it! Check out the combination of privacy landscaping, neighboring walls and positioning of homes in back. This is truly a beautiful , newer Florida home in a very desirable area and at an excellent price.